This is the second in a series of articles on the growth and impact of Chabad-Lubavitch worldwide. The oldest daughter of Rabbi Menachem and Rivka Block—Chabad-Lubavitch shluchim, or emissaries—in Plano, Texas, Mushkie recalls watching videos of the Rebbe each week after Shabbat and writing letters to send to the Ohel in Queens, N.Y., the final resting place of the Rebbe and his father-in-law, the sixth Lubavitcher Rebbe—Rabbi Yosef Yitzchak Schneersohn, of righteous memory. 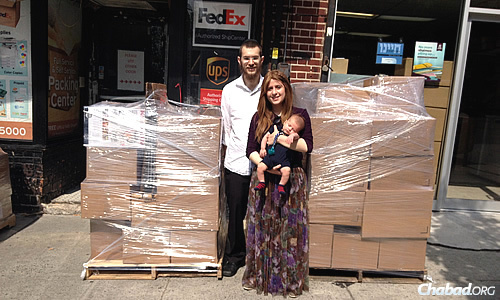 Part of that life means following her parents’ lead—and the Rebbe’s guidance—and moving with her husband, Rabbi Mendy Kesselman, and their 6-month-old son to Frisco, Texas, where they rented a home and have started their own Chabad House. They are one of more than 90 young couples who, along with their children, have gone out on shlichus since January. Rabbi Kesselman will also be among hundreds of young emissaries participating in the annual Kinus Hashluchim, the International Conference of Chabad-Lubavitch Emissaries, which takes place in New York from Nov. 19 through Nov. 24. 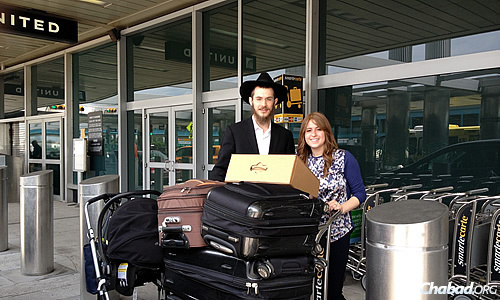 In U.S. states like Mississippi, Montana, Pennsylvania and New Jersey to international destinations such as Aruba, Costa Rica, Vietnam and beyond—and of course, to Israel—these couples hope their actions will fulfill the dreams of the Rebbe to spread the light of Judaism to Jews around the world, no matter how far removed they are from a Jewish population center. While “going out on shlichus” might sound like a short-term stint of volunteerism, what it really means is that these young representatives are committing to leave behind families, friends and established Jewish communities to move—and stay permanently—in a new city, state or country for the long-term. This magazine gets sent to shluchim, offering helpful advice and useful information. Rabbi Henoch Rosenfeld, 25, says he has vague memories of meeting the Rebbe during family visits to 770 Eastern Parkway—the worldwide headquarters of the Chabad-Lubavitch movement in the Crown Heights neighborhood of Brooklyn, N.Y. Most of those visits were on Sundays, when the Rebbe would take hours to meet Jews from all walks of life, handing each of them a $1 bill, along with a blessing. Rosenfeld still has several of those dollars. And he absorbed the message. Those memories are helped brought fully to life in videos that Rosenfeld’s parents—Rabbi Yisroel and Blumi Rosenfeld, co-directors of Chabad Lubavitch of Pittsburgh, Pa.—have of their youngest son meeting the Rebbe. Such video and audio recordings of the Rebbe have become vital links to those who had no opportunities to meet the Rebbe during his lifetime. 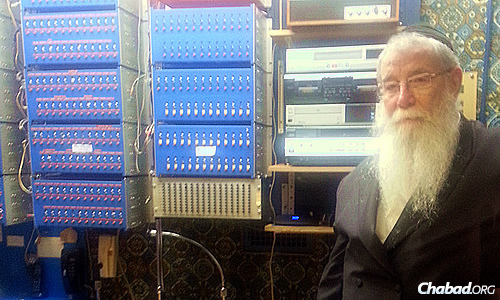 Films of the Rebbe are “instrumental in giving the new generation a feeling and concept of who the Rebbe was and how he interacted with people,” explains Rabbi Chaim Halberstam, who for years arranged for communities outside of Crown Heights to hear the Rebbe’s addresses via a massive telephone relay system. 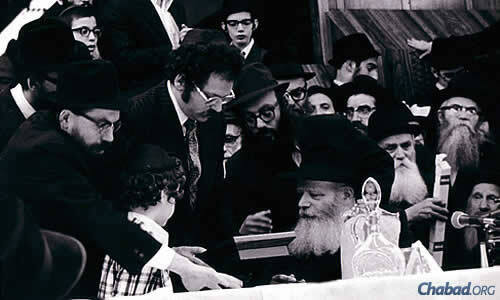 Films and videos of the Rebbe are “instrumental in giving the new generation a feeling and concept of who the Rebbe was and how he interacted with people,” explains Rabbi Chaim Halberstam, who for years arranged for communities outside of Crown Heights to hear the Rebbe’s addresses via a massive telephone relay system. Yet how does that sense of belonging translate into the drive to leave home and a familiar community to go far and wide to spread the word of Torah and Judaism? For members of earlier generations, that determination came in a direct response to personal requests from the Rebbe that couples go and inspire other Jews who may not have had the same exposure to Judaism that they did. The current generation, however, has no such directive. Nonetheless, dozens of couples have gone out on shlichus since the beginning of 2014. For those who become Chabad Chassidim later in life, particularly as young adults, the push to become shluchim comes from a desire to pass along the gift they say they have received to others in similar situations. 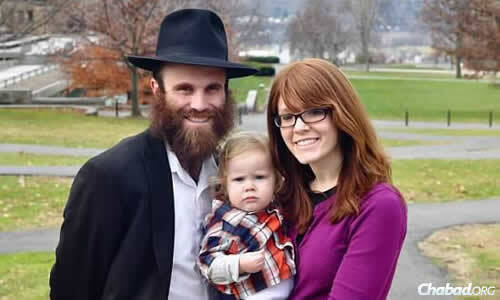 Miri Birk and her husband, Rabbi Dovid Birk, discovered Chabad when they were in college: she at the University of Virginia in Charlottesville, Va., and he while in college in Australia. Today, the Birks and their young children serve as emissaries at the Roitman Chabad Center at Cornell in Ithaca, N.Y., under the direction of Rabbi Eli and Chana Silberstein. Rabbi Dovid and Miri Birk work as Chabad emissaries at the Roitman Chabad Center at Cornell University in Ithaca, N.Y., under the direction of Rabbi Eli and Chana Silberstein. For Rochel and Rabbi Motti Flikshtein, who like the Birks weren’t raised in the Chabad-Lubavitch community, the impetus for becoming shluchim came after realizing that there wasn’t anything else that would bring them as much satisfaction in life. That’s exactly what he did, and the Flikshteins now serve as shluchim in the state of Delaware under the direction of Rabbi Chuni and Oryah Vogel. Regardless of their background, each emissary faces a level playing field as he and she try to build relationships with a new Jewish community and their neighbors, as well as seek funding to sustain their calling. In some ways, their task is easier than it was for generations before them, thanks to an organizational infrastructure designed to ease some of those burdens. There are email groups for sharing ideas and concerns; a shluchim placement office that tries to match those wanting to go out and serve as emissaries with communities looking for Chabad representatives; and then there’s Merkos Suite 302, a division of Chabad-Lubavitch headquarters that takes the “best practices” from Chabad Houses worldwide and creates formal programming materials. Those workshop guidelines, educational curriculums, kits and more are then made available to other Chabad centers. More than 30 programs are run out of the office, the most recent of which—Chabad’s CKids, CTeen and young professional initiatives—focus on specific demographics within a Chabad House. The goal of these new programs is to create additional outreach opportunities, allowing Chabad representatives to specialize in one demographic and have a greater impact in that area than was previously possible. “It’s like a grass-roots organization,” notes Kotlarsky. “We hear from shluchim about what their needs are, pick the ideas that work best and bring them together” to create successful programs. 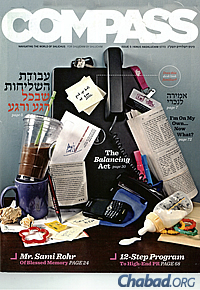 There’s even a magazine—Compass—for shluchim with advice from their peers. A recent issue included tips for balancing family life and community obligations, information on fundraising, and an article about an organization for emissaries who have children with special needs. It’s a much different environment than when Rabbi Shimon Lazaroff went on shlichus with his wife, Chiena, in 1972. “When I started out, we had to pull our own wheels. We had to do our own initiatives. Today, thank G‑d, it is much easier. We have resources like the Shluchim Office, Chabad.org and the Jewish Learning Institute. “There are many, many projects and ideas that have already been done and developed,” he continues, and they can be used by new couples in individual Chabad Houses. The Kesselmans at New York’s LaGuardia Airport, ready to leave for a new home in Texas. If new emissaries are going to be as successful as they can be, then they’re also going to have to do something previous generations could never have envisioned—namely, use technology to its fullest. While this current generation of emissaries is largely following a generation that had specific orders from the Rebbe, what of future generations? For today’s young shluchim who are building their own communities and families, a key concern is how to impart the Rebbe’s memory and message to their own children. “The real question,” says Mushkie Kesselman, “is how we can pass it on to the next generation? When my parents talk about their experiences with the Rebbe, it is a whole different feel. They have a far-away look—an intense, strong passion so heavy you can sense it. Every Yom Kippur, my mother would tell us what it was like with the Rebbe that day. It was bringing to life what was in a very explicit way because she was there” to experience it for herself and then pass those experiences on to her children. According to Rabbi Lazaroff, one answer is to live by example. “My advice is to be yourself, be a Chossid, and don’t take shortcuts,” he advises. “Be totally dedicated and do what you know the Rebbe wants you to do, and the children will look at you, and see what you do and how you behave, and this will rub off on them.